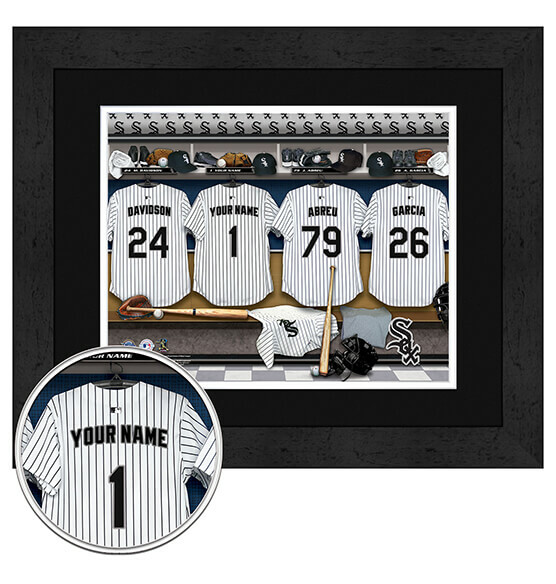 With its high-quality digital double mat in team colors and customizable jersey (up to 12 characters), this Chicago White Sox Personalized Locker Room Wall Art Sports decor is a great gift for any ChiSox fan! Your name will be right there next to other team superstars in this fantastic MDF vinyl-wrapped frame, vibrant print and glass. You'll immediately see and feel the difference of our premium-quality product that's ideal to hang in your fan zone, home or office. Whether you're purchasing this custom piece of art for a birthday or another special occasion, they will cherish this gift for years to come.